Sometimes you need to do something else. 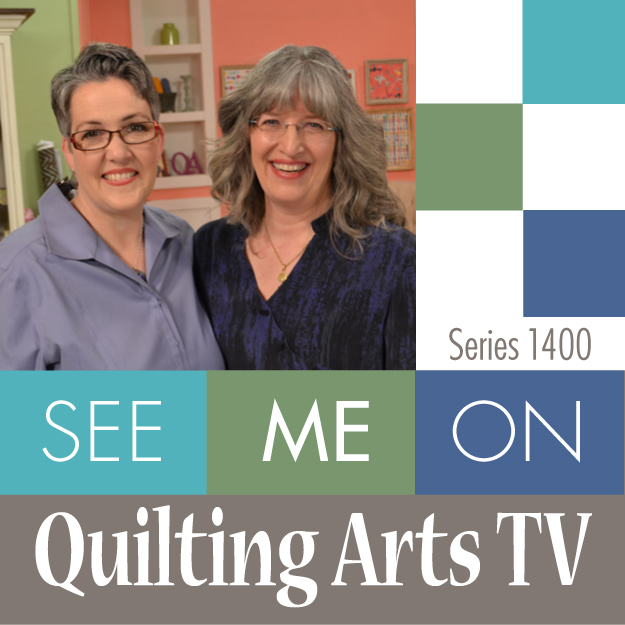 You totally love your main “thing” (in my case it is clearly art quilting), but you need a break. And sometimes, that makes your main “thing” even better. I’ve learned over the years that good design is good design, whether it is landscape, interiors, architecture, photography, painting, sculpture, apparel, the principles are the same. So I have taken online classes in drawing and photography and been enriched. At least ten years ago, I sat down between Christmas and New Year’s desperate to do something creative. The boys were still pretty young so time was scarce. I grabbed a pile of magazines and started tearing out words and pictures and glued them into my sketchbook. That has become an annual tradition…at least most years. This year Widgeon decided he needed to see if the collage passed inspection. Happily, it merited a wag. I don’t know if I’ve done it every single year, and some years — like this one — it was done in (late) January instead. But I like reading what words have called me to use them and seeing where my head was in a given moment. This year, I made sure to add information about whose artwork or photo. As with most years, a lot of my fodder comes from Down East magazine. 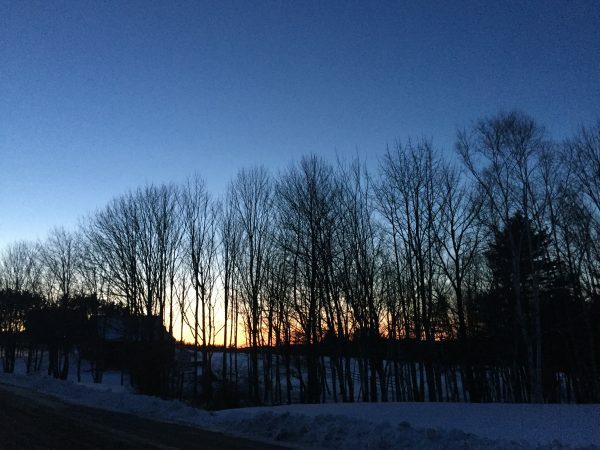 North by East is a monthly column, and in December they featured work by Ryan T Higgins, a Maine Children’s book author. I must now go to the Library and see what they have of his. I was also stunned to see the “Sarah” quote, obviously about another Sarah. I covered up the “big” before dreams, but otherwise I really liked it. This page got pretty dense…but I liked the quote at the top (from an ad for something). I also liked the bit on the pink, but it was too much pink, so I covered it up. Using blocks of text upside down or sideways works. And I LOVE torn edges…LOVE LOVE LOVE…that exposed white framing the image or words. I also dug out my circle punches. Have some circles and a few squares. I’ve also taken a number of outstanding art classes from Val Webb over the years, ranging from birds to children to faeries to animals, using pencil, ink, watercolor, colored pencil…I learn so much, both about materials and tools but more importantly about SEEING. Observing. I’ll never want to be a colored pencil artist, but taking birds in colored pencil with Val taught me about patience and layering. 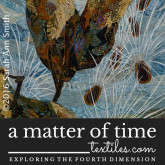 I found I now do that with dyes, with paints on cloth, with thread, in my art quilts. And this year I also took a brilliant course at Sketchbook Skool, Watercolor. I always want more watercolor! 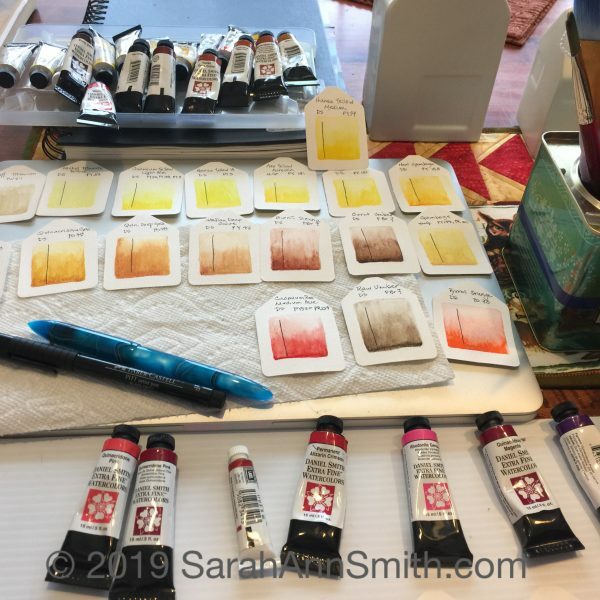 Over the past 8 years or so I have learned about the difference between student grade and artist pigments, that using quality paper makes all the difference in the world, and using pure pigments and mixing your own (just like dyeing fabric!). I decided I needed to get a bit organized and SEE the actual colors painted out from each tube. I had bought some icky (Bienfang) cheap watercolor paper that I will never use for a finished anything, not even a class practice piece. So got out my “tag” punch and did a paint out of every tube I have. Then ordered two more tubes! In search of the perfect pink…..and replacing one teeny tiny tube that is almost done. Each tag has the name, code for the manufacturer, and the universal pigment code (PV 42 for example is Permanent Violet 42). Yes, you can go wwwwwaaaaayyyyyy down the rabbit hole with this stuff! A good mail and watercolor day. Turns out quilting templates and rulers have lots of uses, of course we all know that! I saw the clamshell cases at Jetpens.com and couldn’t resist. When I went to order, I discovered I had left that awesome washi tape in my cart, so it had to come to me also. And then there are those two tubes of watercolor and some empty half pans. That’s another thing I learned: make your OWN palettes with your favorite colors, use magnetic tape that sticks to the bottom of the pan, put inside a palette or metal tin. And then I used my quilting rulers and circles to mark a grid in my notebook/sketchbook. I used to have both my to-do-etc notebook and a sketchbook. I never had the one I wanted handy. So I said to heck with the cost, and bought a GOOD sketchbook and use that as my “everything” journal. 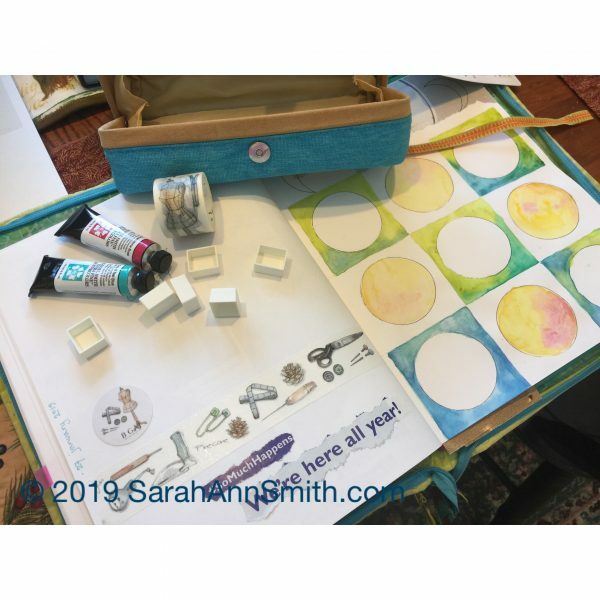 I write lists, take notes at SAQA (Studio Art Quilt Associates) meetings, suss out ideas for quilts, and sometimes even sketch or paint in it! Now I will start filling in the circles with words, quotes, ideas, images/sketches, may fill the white backgrounds with ink textures…we shall see! Sunset from the bottom of our driveway. 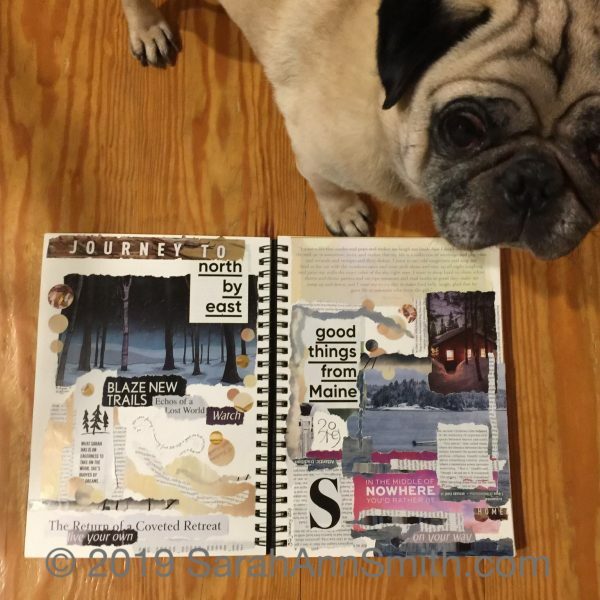 This entry was posted on Saturday, February 2nd, 2019 at 10:55 am	and is filed under Art, art quilting, Art Supplies, Classes I've taken, Color, Drawing, Favorite Products, Inspiration, Maine, Paint, Photography. You can follow any responses to this entry through the RSS 2.0 feed. You can leave a response, or trackback from your own site. 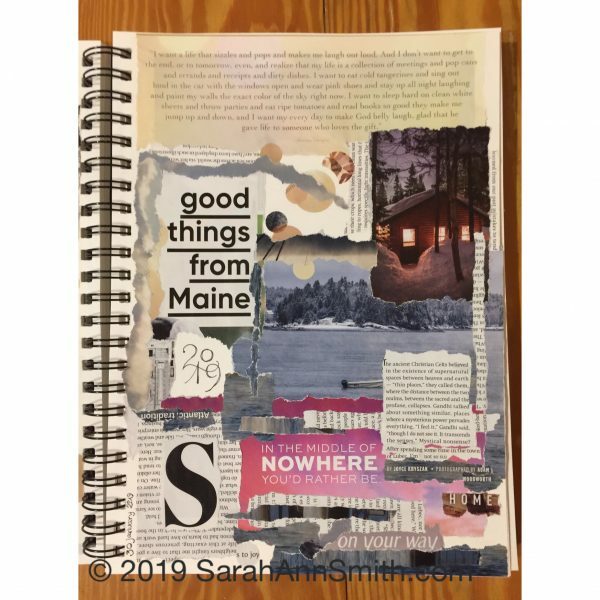 I’ve spent several hours the past week going through piles of pages I’ve saved from magazines, in my effort to declutter my designated “sewing room.” I, too, have been thinking about collage again. Many of these pages are from art and auction catalogs, old Communication Arts and other graphic design magazines I subscribed to years ago, etc. Was hoping to get rid of most of them, but in true Marie Kondo style, only about 10% of them don’t “give me joy”! I’ll allow myself two file cabinet drawers for them when done, well organized… Also getting into into watercolor and learning to see color–recently took one of Jane LaFazio’s online journal watercolor courses. Thanks for writing Paula. I hear you…my books are my friends..they were there in my childhood. I have no idea how anyone could get rid of books. I have about 25 years worth of Threads magazine, the same of Quilters Newsletter. But I have started to let go of some, and keep hoping for down time from quilting so I can sell off some of the “stuff” that I will never use (those crystal goblets that were a wedding gift 36 years ago and haven’t been used once)! 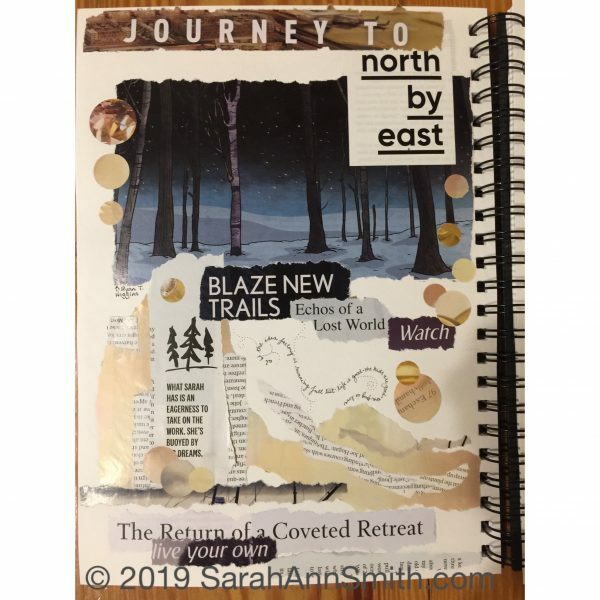 Jane LaFazio’s journaling class is the first one I took, in 2011! Enjoy it! You’ve inspired my to cross pollinate so I signed up for the Sketchbook Skool Watercolor course. I’ve collected some nice brushes, paints and sketchbooks but never seem to get anywhere on my own so I’m hoping this will get me off to a good start and help me develop the habit so I keep at it. Also dusted off my poor neglected Sweet 16 and have a stack of spray-basted quilts ready to get me back into the groove of quilting after a year of neglecting that habit. Thank you! Hooray! The three lessons by Ian Sidaway were absolutely wonderful for me…answered a lot of questions I’ve had over the years and never had so clearly or effectively explained. He’s a master and can’t believe he actually agreed and did three lessons for SBS! 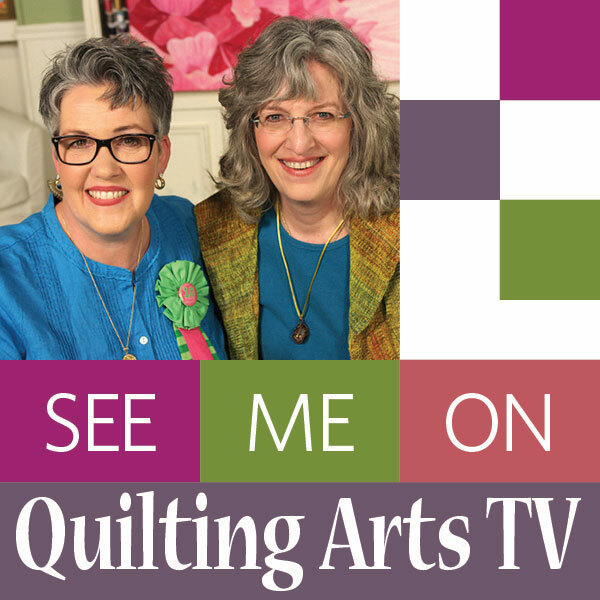 Enjoy…and good luck getting those quilts quilted!